April 2017 marks seven years since the first bowel cancer screening test kits were issued in Northern Ireland. As the first 50 kits were sent out in the post, we hoped that all the plans we had carefully put in place would run like clockwork. We watched as the initial kits were returned to the screening lab, the results letters issued and the first individuals with positive screening results underwent their colonoscopies. I remember very clearly the first screen detected cancer we diagnosed – proof that this programme was going to work. The screening programme has come a long way since those early days and is one of the most rewarding areas of work to be involved in. The ability to offer people a chance for an earlier cancer diagnosis that could significantly affect whether or not they survive is not something the majority of healthcare staff get the opportunity to do. However, with every complex system come challenges. Persuading people to participate in a screening programme that involves a home testing kit and collecting a faeces sample has not been easy. Initial uptake in Northern Ireland was 46% - much lower than the participation we see in other cancer screening programmes. This was slow to improve so we carried out research with focus groups to get a better understanding of why some people don’t respond to their screening invite. Make the test kit easier to use. Much work has been done over recent years to address these issues. We have altered the language we use to emphasise that people can survive a cancer diagnosis and we are much more aware of promoting the current uptake rate in a positive way. We have run public information campaigns and established a programme to train community facilitators to deliver education sessions on cancer screening to those living in our most deprived areas or with special needs. We have produced a video illustrating the patient journey from screening invite to colonoscopy to try to reassure those who may have concerns and worries about completing the test kit. All of this has impacted on our participation rates, with Northern Ireland now achieving an uptake of 60%. But there is more to do. The use of the new Faecal Immunochemical Test (FIT) kit has been recommended for bowel cancer screening by the UK National Screening Committee. 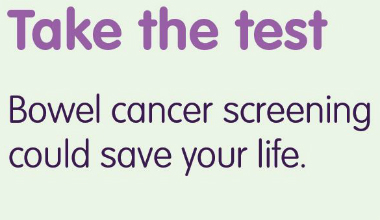 As well as being a more effective test in terms of identifying cancers, it is also recognised that this test kit is much easier to use and is likely to result in more people participating in screening. A formal decision to introduce FIT testing into the programme in Northern Ireland has not yet been taken by the Department of Health and will require Ministerial approval. While we are waiting for the current political situation in Northern Ireland be resolved and policy and budget decision making processes to be reinstated, those involved in delivering the screening programme are making tentative plans for how FIT could be introduced here. As well as looking at participation rates, we are continually exploring ways in which we can further improve the quality of the screening programme and the experience of patients. We have put processes in place to report on and learn from any incidents occurring in the programme and to identify and review any cases of colorectal cancer which are diagnosed between screening episodes. An important aspect of learning involves getting feedback from patients. In 2016 we undertook our second patient satisfaction survey for the Northern Ireland bowel cancer screening programme, where people attending for a screening colonoscopy were asked to complete a questionnaire about their experience. The questionnaire covered all aspects of the programme, from the initial information they received with their test kit, to attending for a colonoscopy. The responses were overwhelmingly positive with the majority of people reporting that they were well informed and staff were supportive and professional at every step. We have some work to do to improve how people get the follow up results of their colonoscopy, but most people indicated that they would recommend screening to a friend. Overall, the bowel cancer screening programme is a proven success with very early stage cancers being diagnosed and treated successfully. As we move forward, the challenge is to continue to look for ways to improve the service that we provide and ensure that our population is given the information and support they need to make informed decisions about participating in cancer screening. More information on cancer screening in Northern Ireland can be found at Cancer Screening Northern Ireland.